Lance Maggart | Sky-Hi News Smoke from the Silver Creek Fire rises above the Gore Range northwest of Kremmling on Monday evening, Aug. 13. GRAND COUNTY — With the Silver Creek fire raging just a few miles away from their homes, residents of the unincorporated community of Old Park near Kremmling remained under pre-evacuation status late Tuesday afternoon, Aug. 14. No evacuation orders had been issued as of 4:30 p.m. Dozens of sheriff’s deputies and other emergency personnel were staged in the area throughout the day Tuesday in anticipation of evacuation orders, which, if issued, would be prompted by continued fire growth toward the sparsely developed area west of Wolford Mountain Reservoir. Tuesday’s pre-evacuation status for Old Park followed the evacuation of Latigo Ranch on Monday, Aug. 13, after the Silver Creek fire expanded south and threatened the popular ranch. The fire has now grown to 3,198 acres, according to Inciweb, an all-risk incident web information management system provided by the U.S. Forest Service. Officials decreased the level of containment to 5 percent from the 13 percent that had been reported on Monday. Winds at the scene are actually helping crews with fighting the blaze, as they have shifted to blow to the north, into the fire, no longer pushing the fire closer to structures. On Monday evening, local fire officials began notifying residents of Old Park, which contains about 200 homes, that the area was being placed on pre-evacuation notice. A community meeting was held Monday night at Kremmling Fire’s Old Park fire station just off state Highway 134 and featured emergency personnel reviewing the procedures residents should take in anticipation of evacuation orders. Officials are also stationed in the town of Kremmling in preparation for any evacuation orders. An air quality health advisory was issued by the Colorado Department of Public Health and Environment on Tuesday for large portions of Western Colorado due to the fires burning in and around the state. The advisory is in effect until 9 a.m. Wednesday morning and covers 22 counties, including Eagle, Routt, Grand, Garfield, Summit, Pitkin and Lake. The recent increase in the Silver Creek fire activity, caused by hot, dry and windy conditions, is contributing to poor air quality. Health officials advise staying indoors if heavy smoke is in the area, especially for children, the elderly and those with heart disease or respiratory illnesses. If visibility is less than five miles, then the air quality is considered unhealthy. Around 110 fires are currently burning across the country, with 12 in Colorado alone, according to Inciweb. In addition to the Silver Creek fire, nearby wildfires include the 1,280-acre Sugarloaf fire, which is also burning in Grand County, 13 miles southwest of Frasier, and is 35 percent contained, and the Lake Christine fire near Basalt is 90 percent contained and has scorched 12,588 acres. 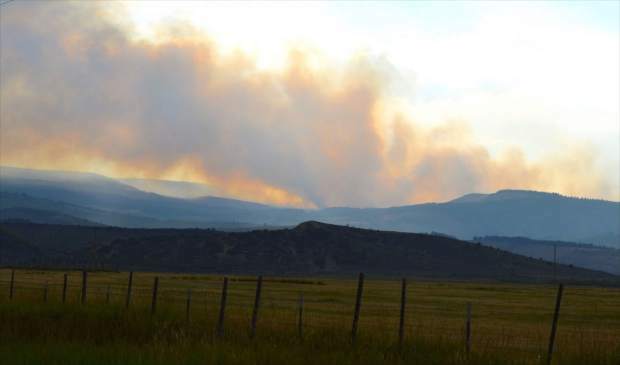 Further west, the Cache Creek fire, located approximately 8 miles southwest of Rifle, is 40 percent contained and had burned 2,500 acres as of Tuesday, Aug. 14, and to the northwest, the Cabin Lake fire near Meeker has grown to 2,450 acres and is 45 percent contained, according to Inciweb. Sky-Hi News Reporter McKenna Harford contributed to this report.